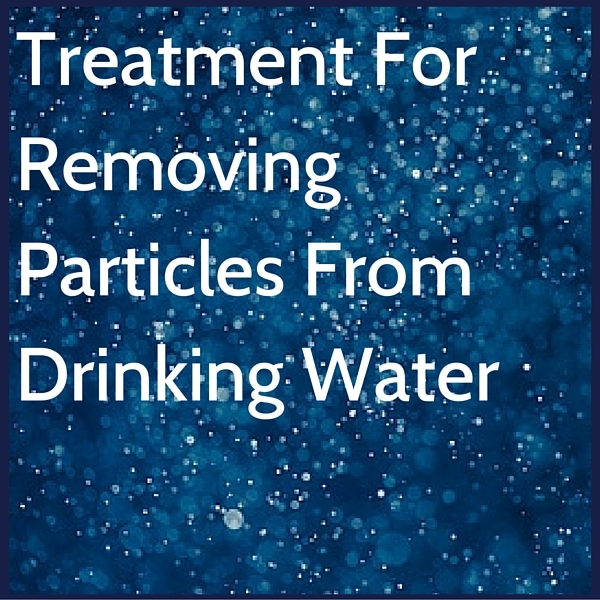 No one wants to see strange floating particles in their water or a mysterious sediment at the bottom of their glass, but we sometimes get calls from customers who have found particles in their water and want to get them out. Particles floating in a glass of water can be unpleasant, but these issues are usually not harmful to your health and are merely aesthetic. White particles or cloudy water can be caused by organic materials picked up as the water flows through the ground, or inorganic particles, such as minerals, suspended in the water. Brown sediment in water can appear when a well is recently dug, or could indicate a problem with the well. Most kinds of particles can cause staining of water fixtures, sinks, and tubs, as well as laundry. Inorganic particles can damage plumbing systems, having a corrosive effect on pipes and fittings. Depending on the specific problems, these issues can be fixed with a water softener or filtration system. Brown or orange particles can sometimes indicate sand has gotten into your well system, but it can also be small pieces of rusted steel that have broken off the inside of your water pipes or the water mains. These particles are hard, jagged pieces that are irregular in size and shape. Color can vary from orange to black. They consist of mostly iron and are not a health hazard. These particles can, however, clog your washing machine screens, shower heads or the aerator screens on your faucets. Brown or orange particles in the water can also be a sign of a broken water softener. Inside a water softener are small beads used for filtering the water. Sometimes these beads can break away and get released into your water. They vary in size and color, but most beads are brown or orange and about the size of fish eggs. If you suspect these beads have gotten into your water system, call a professional immediate to fix the softener. Black particles most often come from a water filter, a degraded faucet washer or gasket, or from a deteriorated flexible supply hose. If the particles look similar to coffee grounds, they are probably granular activated carbon from inside a water filter. This is easily fixed by replacing the filter cartridge. If the problem persists, consult with the manufacturer of the unit or a water systems professional to make sure a bigger problem is not to blame. If the particles are small black specks that look oily or sooty, they are probably from a black rubber flexible hose. Over time, the chlorine in the water breaks down the rubber. To fix this problem, simply replace the hose with one that has a protective lining. White or tan particles can make your water look cloudy, or can be more pronounced. They usually come from calcium carbonate and magnesium carbonate dissolved in the water. Larger chunks are referred to as pipe scale. Calcium carbonate and magnesium carbonate are naturally occurring minerals found in water around the world. In higher concentrations, it can make water hard. Over time these minerals can deposit in pipes and eventually break off and get into your water. Adding a water softener to your home water system can also cause more deposits to flake off. These deposits can clog shower heads and faucet aerators, but installing a water softener will alleviate the problem over time. Contact us to learn more about water quality and how to ensure your well water remains safe.